MBL International has a wide portfolio of immune monitoring research products including tetramer technology for vaccine development, rapid T-cell detection and quantification in the pharmaceutical industry or bioresearch industry. MHC Tetramers provide you with the means to rapidly detect and enumerate antigen specific T cells directly from ex vivo (patient) (donor) samples without the need for cell stimulation. MBL's broad MHC Tetramer product portfolio utilises proprietary technology licensed from Beckman Coulter. MHC Tetramers are complexes of four Major Histocompatibility Comples (MHC) molecules which are associated with a specific peptide and bound to a flurochrome. There are two types of tetramers, Class I and Class II. There is also the option to have a custom tetramer manufactured, containing the peptide sequence appropriate for your research. Major Histocompatibility Complex (MHC) tetramer technology utilises the MHC/peptide complex to detect antigen specific T cells at the single-cell level, thus surpassing detection limits of traditional cell-based methods. MHC Tetramer technology is the most accurate method for detection of rare events. The information MHC tetramers provide is pivotal to the direct development of vaccines and therapies, as well as monitoring patient responses during clinical trials. 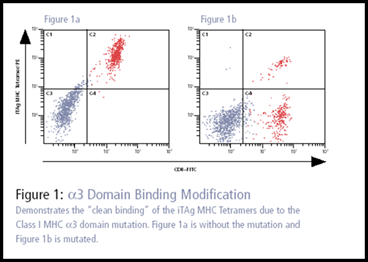 To greatly reduce non-specific binding, Class I iTAg MHC Tetramers specific to human alleles have a proprietary mutation in the α3 domain (see figure 1 below). Flow cytometry enumeration of specific T cells is often unreliable and inaccurate due to the low affinity antigen-specific T cells have for their cognate peptide-MHC (pMHC) class I or class II complex. Effectively separating positive and negative cell populations becomes problematic. iTAg™ MHC Tetramers provide 4 pMHCs allowing for greater affinity and detection in low affinity interactions. Reduced non-specific binding due to proprietary mutation in the alpha-3 domain in human MHC class I tetramers. Further information can be found at www.mblintl.com/tetramer. - Quantitate tetramer positive CD8+ T cells for further functional characterisation. CD4+ T cell splay a role in many diseases, specifically autoimmune. Analysis of these cells has long been hampered by a lack of suitable assays. MBLI's commitment to meeting clinical research needs is driving the development of Class II tetramers for analysis of CD4+ T cells. MBL Provide a custom tetramer manufacturing service. All custom tetramers require a feasibility study (Product Code T05000) to be performed prior to tetramer production. For MHC Class I tetramers an algorithm based predication is initially made. This calculates the affinity of the peptide sequence required by the customer, with the specific MHC Class I allele chosen. If the algorithm prediction indicates that successful tetramer production is likely then production of the monomer is undertaken. A HPLC run of the MHC class I/b2 microglobulin/peptide fold then allows determination of whether the peptide has been integrated in the MHC class I/b2 microglobulin complex. 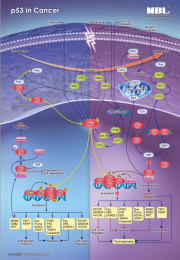 If successful then tetramer production occurs. For MHC Class II tetramers peptide screening is performed using a HPLC mini-load of peptide/MHC class II. This allows determination of whether the peptide is bound to the MHC class II complex or not. If bound, production of the loaded monomer is undertaken, followed by production of the tetramer. In this option, the customer supplies the sequence of the peptide and peptide manufacture is performed as part of the tetramer production run. Customers choosing this option will be charged a peptide acquisition fee. The peptide acquisition fee depends on the MHC Class of the tetramer to be produced. For manufacture of a MHC Class I tetramer please see product code T05008. For manufacture of a MHC Class II tetramer please see product code T05012. Please click here and fill out this form if you would like to order a custom tetramer and MBL acquire the bespoke peptide. Here, the customer supplies the relevant peptide. There is no additional fee for this option. Please click here and fill out this form if you would like to supply the peptide for your custom tetramer order. If you require any further information regarding tetramers or the custom tetramer ordering process, please do not hesitate to contact Hannah by email Hannah@caltagmedsystems.co.uk or phone 01280 827460.